Abbey needs a home. Do you need a dog to love? Last year my wife and I rescued a wonderful 2 year old fox hound from the Humane Society. We named her Abbey and she is a very good companion. However, as we are expecting a baby girl in December, Abbey will be too much for us to manage while attending to an infant. If you are a walker or runner, she is an ideal training partner. I take her out on a 2 – 4 mile run (rain or shine) at least 3 days a week and she loves being outdoors. 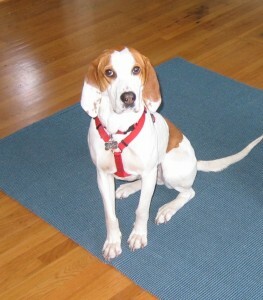 If Abbey sounds like she may be compatible to your lifestyle, or if you know someone looking for a pet, I strongly encourage you to first check out a description of her breed [See American Foxhound]. Also, if you own a cat, ferret or a similar non-canine creature, then a foxhound under the same roof is simply not a good idea. One important necessity for her breed is a tall enclosed fence with no escape routes while you are away. If left alone for long periods, the fox hound will get bored and become curious to explore the various interesting scents wafting through the neighborhood. However as long as people are at home, Abbey has no incentive to run off and contents herself with sleeping on her cushion, that is, after you’ve taken her out to play. When people are around, she is a very good indoor dog. We have grown very attached to her, and want to ensure that she finds a suitable home that would be conducive to mutual happiness with her owner(s).